The Dark Side of the Moon - Essays and Articles by Jim Freeman: Is America on its way to becoming Greece? Is America on its way to becoming Greece? Greece has a basket-full of problems, an impending yard-sale of what assets remain. America has little in common with most of them, but one is outstanding in its similarities: income tax collection. Before you get all bent out of shape with my take on it, consider what the two nations share, rather than how we differ. Greece has an estimated annual loss from uncollected taxes approximating $30 billion. That’s tax evasion on a major level and of course righting those wrongs takes political will as well as a change in a social culture that sees fiddling the taxman as a national sport. United States losses from uncollected taxes currently approach $400-$500 billion annually. That culture of non-compliance is growing, fed by Corporations and individuals that can afford (legally) to shelter their income. It’s made more dire by the growing inability of the IRS to enforce the collection of taxes actually due. Are we well on our way to becoming Greece? Certainly not by that bare-bones comparison but there are additional unsettling circumstances in America that draw us closer. Interesting (in fact, fascinating) is that the IRS estimates annual unreported income at $2 trillion. That’s a huge number, considering that collecting the tax due on that amount would likely balance the total 2015 national budget. More to the point is that the IRS, already short of both cash and employees to enforce collection, had its budget cut by 18% over the last five years. The Dallas office recently made headlines by admitting it would not chase taxpayers owing less than $1 million. What a lovely message to the average guy struggling to cough up what he owes. That’s a social message matching Greece. Thirty corporations, whose combined pretax U.S. profits totaled $160 billion over the 2008-10 three year period, paid less than nothing in aggregate federal income taxes. These thirty companies included Pepco Holdings, General Electric, DuPont, Verizon, Boeing, Wells Fargo and Honeywell. What does less than nothing mean? It means, although they were hugely profitable, they now have ‘tax-loss carry-forwards’ in excess of $10 billion. General Electric filed a negative 45% income tax and theirs was not even the largest tax loss of the bunch. In the face of that (perfectly legal) audacity, General Electric just announced plans to buy back $10 billion of its own stock with those untaxed earnings. Whew! Wish I could do that. That double standard attacks both our American underpinnings of fairness and the rule of law, further eroding an already shaky trust in government. Meanwhile Congress, due to shortfalls in tax revenue, continues to cut social programs for the poor and disadvantaged. The same ‘austerity’ is being forced upon Greece by the European Union. For decades Greece has been so fleeced by its wealthy that it simply gave up on itself. The ‘house’ in which Greece lives is called the European Union. 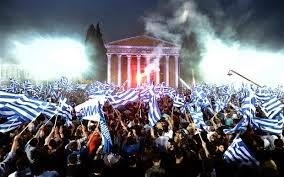 It seems increasingly likely that Greece will be the first national occupant to be thrown out of that house and onto the street.